The most beautiful creations have the power to endure over Time, retaining their power to astonish and delight century after century. As only creative geniuses can, the Manufacture Jaquet Droz has never stopped striving to surprise, amaze and inspire dreams since its founding. Starting in the late 18th century, the spectacular automata — The Writer, The Musician and The Draftsman — breathed new life into man's fascination with the idea of constructing an artificial human. These fabulous devices immediately won over Louis XVI, Marie Antoinette and the French court at Versailles, before conquering the other royal courts of Europe. Ever since, the Manufacture's philosophy has remained unchanged. It aims to endow these objects with every superior quality so that their possessors will gaze at them in wonder, year after year. It applies these demanding standards to technical performance and time-keeping complications as well as its aesthetic choices. This perpetual quest for excellence gave birth to La Machine à Ecrire le Temps. This project was the brainchild of Manuel Emch, President and head of artistic creation at Montres Jaquet Droz, and was developed by the engineers and artisans at the Manufacture in La Chaux-de-Fonds, Switzerland. Firmly established in original company tradition, this project had only one objective: to create something dazzling! The result was astounding high-tech performance, inspired as much by the visionary spirit of the house as by its expertise. Prepare to be amazed! From Versailles to Basel, Jaquet Droz has kept its promise by infusing all of its stunning masterpieces with magic and an element of the unexpected. Time is the ultimate luxury, the one thing that humans most desire. It is the rarest of all luxuries, even if it seems to be the most easily shared. Fleeting and elusive, Time marches on at a pace governed by no man. Eternally fascinated, mesmerised, men have always made passionate attempts to find a way to suspend its flow. In vain! They have measured Time using a broad array of instruments - sun dials, water clocks, hourglasses, cumbersome clocks and slim pocket watches - devised by ingenious minds obsessed by a common desire to transcribe the passing moment and, since time cannot be stopped, at least to attest its existence. Going straight to the heart of this enigma, the Manufacture is paying retro-futuristic tribute to the mysteries of Time with its fabulous La Machine à Ecrire le Temps, the fruit of phenomenal technical performance and deep philosophical reflection. It took eight years –eight being a decidedly essential number for Jaquet Droz – to design and build this inconceivable object combining poetic purity with mechanical prowess. More than two centuries after impressing the crowned heads of Europe, Jaquet Droz offers the early 21st century a masterpiece that, thanks to its ingenious craftsmen, brings man's ultimate dream to life: to literally record the march of Time. It took nearly a decade to design this masterpiece containing more than 1,200 components, including 84 ball bearings, 50 cams and 9 belts, and thousands of hours to build it. In La Chaux-de-Fonds, Switzerland, La Machine à Ecrire le Temps is synonymous with all possible superlatives. This time-writing masterpiece is housed in an unusual cage, whose aluminium frame is fitted with a liquid crystal glass, like a monolith travelling through time. A simple touch activates the clever mechanism: it is equipped with a stylus to mark the present time in hours and minutes. It boggles the mind to imagine the dexterity required to bring such an "impossible dream" to life. This wondrous object, issued in a Numerus Clausus edition of 28, features a system converting analogue time – as indicated by the hands of a watch – into mechanical digital time. Jaquet Droz is drawing on the great capacity for wonder that has been shown by mankind since time immemorial. 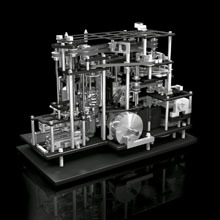 From the Enlightenment to the present day, man has consistently marvelled at each new project executed with unflagging determination and at each new exercise of pure scientific and technical virtuosity, destined to create objects that inspire a yearning in collectors to own them and in professionals to study them. This striking object, upon which so many superlatives have been heaped, is indeed a thing of wonder, an attempt to decipher Time for the very first time. La Machine à Ecrire le Temps is beautiful, complicated, contemporary and magical... and more. 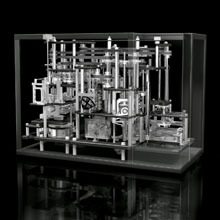 A select few will be fortunate enough to own this fabulous device, protected by several patents: some will look deep into its heart, contemplate the turning gears and attempt to penetrate the mysteries of eternity; others will prefer to simply enjoy its magic, as privileged witnesses of a new form of Time.